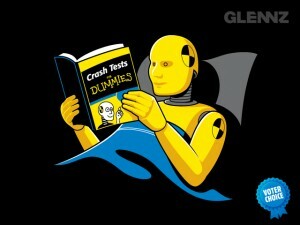 I love the “For Dummies” series of books. I have several of them, on subjects ranging from America’s Wars to Magic Tricks to Boating. There’s something about the format of these books… they hit the right mix of “info for beginners” while not treating you like a moron. Plus, “dummy” is a much friendlier term than “Complete Idiot” (which is another series of books with a similar premise, but is much more insulting). Anyway, here at the library it’s apparently the season for Shelf-Culling (going through books that no one checks out and deciding if we need them or not), and the collecting part of that falls to me. While I do this, I observe the titles and add my two-cents to what I believe we should keep or not… and in the case that I am vetoed regarding something I considered a keeper, they should let me have first dibs. One example is a children’s book entitled “Santa’s Evil Twin”, which I am now the proud owner of. This week, we’re tackling the Health section in Non-Fiction, which rolls us back around to the beginning of this post: The For Dummies books. Train 1: “You don’t need to know anything about Breast Cancer”, or “By the time you get Osteoporosis, you’ll be able to download everything anyone knows about it directly to your cerebral cortex, or at least cure it with a pill”. Train 2: Buh-but… they’re For Dummies books. Thus far, Train 1 is winning. We’ll see for how long.